Gardening can be a great way to relieve stress, whether you have a small window box or a large open space to tend. And more importantly, gardening as a hobby can be less expensive than you might think. Here are some useful tips for any would-be green-fingered gardeners who would like to keep to a tight budget. Glossy gardening manuals might be glossy and full of beautiful photos, but they are also expensive and unnecessary. If you are looking for useful advice and information on how to start or develop your own garden, there are several places you can go for free. The Royal Horticultural Society has an excellent website where you can find lots of information about getting started. The BBC gardening website is another excellent source of gardening tips. If you prefer thumbing through books instead of conducting your research online, why not visit your local library? Many gardeners start by spending a fortune buying new potted plants or flowers from a local store, and then look on with disappointment as their plants wither and die in the garden, because they have been planted at the wrong time of the year and not given the chance to grow. Instead, why not start from scratch by planting some seeds? If you sow bienniel (plants that bloom in their second year) seeds such as foxgloves and hollyhocks you will be given your garden the chance to grow naturally, and you will have a garden that continues to bloom for many years to come. More importantly, buying packages of seeds if far cheaper than paying for fully grown flowers – most supermarkets sell seeds for as little as 30 pence per packet. Do you have friends with beautiful gardens? Well if you ask them nicely they might let you take some cuttings. Many plants such as fuschias and pelargoniums can grow very well from cuttings, provided that you layer the cutting correctly and keep the cutting firmly in the soil with metal supports (a wire coat usually hanger works best). The BBC website can show you how to take cuttings correctly and before you know it you could be swapping a variety of different plants and flowers with your friends! Inexperienced gardeners have a tendency to use too many seeds, hoping that the more you plant the better the likelihood that you’ll get a larger number of flowers. More experienced gardeners however, know that you only need to sow a pinch or two of seeds from a packet to get a good bloom. So try and save the rest of your packet for next year. Keep it wrapped in tin foil and store it in a dry place. With a bit of forward thinking you can save yourself some additional hard work and expense in the years to come. For example, instead of paying for new bulbs each year you can cultivate your spent bulbs by removing their seed heads and keeping them watered and fed with plant food. Look after them now and they should still be usable next year. If you start forking out for gardening tools, such as rakes, lawnmowers, shears and spades, the money soon adds up. Instead. Why not take a trip to your local recycling centre? 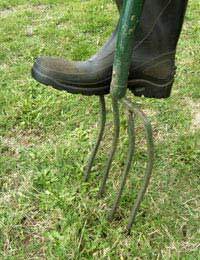 You can also pick up unwanted garden tools on sites such as eBay or Gumtree. Some allotment centres also offer a hire scheme for tools. Compost is a cheap way to encourage your garden to grow naturally, without chemicals or other man made materials. More importantly, by recycling your waste you are making your own contribution to a greener planet. The ideal compost recipe is to mix a combination of ‘greens’ and browns’ in a compost bin. The greens can consist of tea bags, grass cuttings, vegetable and fruit peelings, while the browns can include cardboard, paper, leaves, sawdust and branches. Starting your own garden can be a great hobby, and an excellent way to get regular exercise. And if you follow our tips, it doesn’t have to break the bank either. SO what are you waiting for? Get gardening today!